European Activists Say They Don't Want Any U.S. 'Chlorine Chicken' : The Salt Most U.S. poultry is bathed in a little chlorine on the way to your plate. But that treatment is banned in Europe. Now "chlorinated chickens" are a sticking point in a trans-Atlantic trade deal. Mute Schimpf doesn't want to eat American chicken. That's because most U.S. poultry is chilled in antimicrobial baths that can include chlorine to keep salmonella and other bacteria in check. In Europe, chlorine treatment was banned in the 1990s out of fear that it could cause cancer. "In Europe there is definitely a disgust about chlorinated chicken," says Schimpf, a food activist with Friends of the Earth Europe, an environmental group. The agreement would create the world's biggest free-trade zone and touch everything from banking to agriculture. But there's a lot of opposition to TTIP in Europe, where some fear it would degrade their food standards. And activists have found the perfect symbol for their fight in chlorinated American chicken. On the German equivalent of The Daily Show, called the Heute Show, American poultry has become a running joke. In one skit, a reporter is in the White House kitchen eating a chicken nugget. "You can't be mad at someone who makes such a tasty chlorinated chicken," he quips. "Mmm, it has a slight aroma of kiddie pool." But the chlorine isn't really a public health concern, says Scott Russell, a professor of poultry processing at the University of Georgia. "Most of these concerns about chemical use and those kinds of things are blown up in the media to become a problem that really doesn't exist," he says. 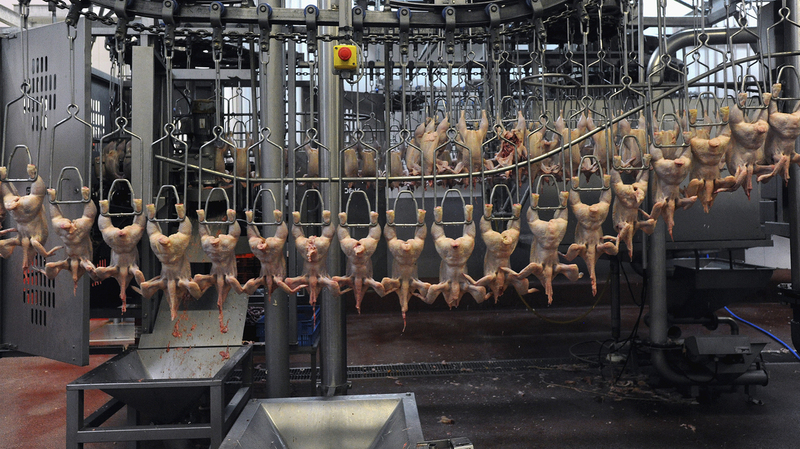 "In Europe, their efforts to control foodborne illness is all in the live bird. For example, the grandparent stock, the breeder stock that makes the egg of the chicken we eat eventually — all of those flocks of chicken are tested regularly for salmonella," Russell says. If any of these chickens test positive, farmers have to get rid of the entire flock. With this method, Europeans have reduced salmonella in their chicken to just 2 percent, Russell says, but the process took 20 years. Europeans have pushed for some of the toughest food-safety standards in the world. They want to eat fresh chicken that's air-chilled rather than dumped in chlorinated water tanks, says Cees Vermeeren, who manages the European Association of Poultry Processors and Poultry Trade. "The main principle of the European food policy is a farm-to-fork approach, and you may say that is fundamentally different from what's happening outside Europe in many places," Vermeeren says. That strict food policy makes poultry production more expensive. A study by Wageningen University in the Netherlands found it takes about a dollar in Europe to produce a pound of chicken, compared with less than 80 cents in America. Over 120 countries accept the U.S. processing method, says James Sumner, the president of the U.S.A. Poultry and Egg Export Council. It's cheaper, he says, and Europe doesn't want U.S. competition. "If the truth were to be known, that's the real reason they don't want us there, and chlorine is a convenient excuse," he says. For activists like Mute Schimpf who are trying to sway the public to reject a big treaty that's full of legal jargon and complicated regulations, the chicken argument works. "Very often the chlorinated chicken is used as a symbol of what European citizens and consumers don't want to have as an outcome from the trade talks," she says. Besides changes in chicken production, activists are also fighting the possibility of hormone-treated beef and genetically engineered crops entering the European market if TTIP succeeds. Though the talks between the U.S. and the EU are held in secret, any agreement needs approval from the European parliament, which is elected by a public that worries a lot about its food supply.